Some of the MSU team members who designed and built Montana MULE test their robot at MSU before heading to the Kennedy Space Center. From left are Chris Ching, Steve Pemble, Paul Dallapiazza and John Ritter. (MSU photo by Jackson Harris). (PhysOrg.com) -- A Montana State University student-built robot won a national contest at the Kennedy Space Center Friday by digging the most simulated moon dirt in 15 minutes. 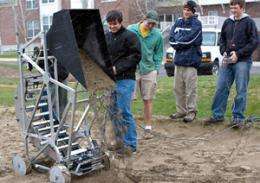 Defeating robots from 21 other colleges and universities, Montana MULE removed 21.6 kilograms of regolith from a giant sandbox. That was far above the 10 kilograms required to qualify in the contest and far ahead of the nearest competitor in NASA's first Lunar Regolith Excavator Student Competition. A robot from Auburn University dug 6.6 kilograms. The University of Southern Indiana's robot dug 2.4 kilograms. Montana MULE was the only robot that met and surpassed the minimum requirement, beating out other, larger universities such as Virginia Tech, Iowa State University and the University of North Carolina-Charlotte. The victory gives the MSU students $5,000, the chance to return to the Kennedy Space Center for a launch, and plenty of thrills. Additionally, the team won the Joe Kosmo Award for their combined work in engineering, outreach and presentation. "I'm supposing my parents won't have much problem with how many video games I played as a kid," Chris Ching said by telephone from Florida. Ching from Belgrade, an MSU senior in computer science, remotely steered Montana MULE to victory by using the controls of an X Box 360 computer game and wireless technology. Ching sat inside a building that was isolated from the arena, so he controlled Montana MULE by watching the robot on a screen. Helping him watch were teammates Jennifer Hane of Fort Shaw and John Ritter of Idaho Falls, Idaho. Ching said the screen refreshed at a low rate, which meant there were lags between what he was doing and seeing. "It was pretty nerve-wracking," Ching said. Loud cheers and applause interrupted a NASA talk show Friday morning when the 120-pound MSU robot became the first robot in the contest to dig more than 10 kilograms of simulated moon dirt. The competition began Thursday, but no robots were able to dig 10 kilograms the first day. A few teams were disqualified. As a result, NASA gave the remaining teams three hours to fine-tune their robots, then started the competition over on Friday. Brock LaMeres, faculty adviser for the MSU team, said a loose wire was the reason Montana MULE wasn't digging on Thursday. Ching could move the robot across the dirt and into the mining area, but he couldn't lower the bucket into the dirt. The students fixed the wire, taped down all their wires and recharged the battery that night. LaMeres said he believes the robot finally did so well because the students incorporated the right combination of systems into their robot. They probably had three or four alternatives to choose from for each system, but they apparently chose the best combination, he said. Montana MULE had wheels, for example, instead of moving like a Caterpillar as some other robots did. It also had a bucket-digging system and a hopper. The robot itself contained a computer system. Ching and LaMeres said MSU also benefitted from some extra practice time. Since MSU still had a few minutes left in its 15-minute allotment on Thursday, Ching used the time to practice running the robot through the course and give the audience a show. He got Montana MULE to do a doughnut. He got it to dodge rocks and craters. He turned it so people could see the MSU Bobcat on its side. "It handled fantastic," Ching said. Ecstatic e-mails, phone calls and chat room comments spread the news that Montana MULE was leading the competition Friday morning. "I hear they are very nervous just sitting around watching, but they're being treated like rock stars. I'm extremely nervous," faculty adviser Hunter Lloyd said from MSU. Students representing three departments and five majors in the College of Engineering, built Montana MULE this school year. Besides Ching, Hane and Ritter, the MSU team consisted of Ben Hogenson and Phillip Karls from Billings, Steve Pemble of Colstrip, Craig Harne of Cutbank and Paul Dallapiazza from Florence. Their faculty advisers were LaMeres in the Department of Electrical and Computer Engineering, Lloyd in the Department of Computer Science, and Robb Larson, Mike Edens and Ahsan Mian in the Department of Mechanical and Industrial Engineering. LaMeres and six members of the team were in Florida for the regolith competition. Lloyd said he planned to attend, but he gave up his ticket for new motor controllers after an April fire. After MSU's performance, Lloyd received an e-mail from NASA, telling him that NASA would pay for him to travel there in July for the introduction of next year's contest, a planetary research vehicle. "This team is all graduating, so we'll be looking for a new group of students in the fall," Lloyd said. This year's team said before leaving Bozeman that the simulated moon dirt would be different from the sand on a Florida beach or the outdoor volleyball court where they tested their robot in a May snowstorm. Since erosion doesn't occur on the moon like it does on Earth, the top layer would be like powdery glass that's extremely loose and super fine. The soil beneath would be small, sharp, jagged particles that are almost as hard as concrete. The students built Montana MULE mostly out of recycled aluminum. They used wireless technology and the controls for an X Box 360 computer game to talk to the robot's electronics system. The electronics system turned a motor on and off. The motor turned a chain that moved small buckets below the level of the wheels. The buckets -- moving as though they were the seats on a Ferris wheel -- dug the soil, took it along for the ride and dumped it into the robot's hopper. The robot then emptied the hopper into a NASA container where the regolith was weighed. Pemble said every system on the robot failed at least once in the development stages. "We finally got to the point where all our weak links got weeded out," he said. "On a wing and a prayer, it worked." LaMeres learned about the competition last year while attending a NASA workshop. He brought back the idea to MSU and obtained NASA funds for materials. The Montana Space Grant Consortium then awarded LaMeres, Lloyd and Larson additional funding for competition travel and for the development of formal senior design curriculum material based on this project so that future students can have a rewarding experience, too. The Montana Space Grant Consortium also provided T-shirts for the students to wear during the competition. Hogenson received funds from MSU's Undergraduate Scholars Program to continue his participation after he finished his senior design class. An awards ceremony was held Friday evening (May 28) in Florida. Besides the dirt digging competition, other categories included team spirit, robot design, video and project presentations.